Have you ever experienced sheer panic at the thought that you will have to buy a brand new outfit for a formal event? If you have, welcome to the club. My yearly formal event participation ranges between 1 to 0 really, so understandably, I don’t own many formal dresses. I only have one long dress in my wardrobe and that is currently packed tightly at home, 2,000 kilometres away. Add the fact that 9/10 times you’ll see me wearing flats and jeans to that, and you have a very reluctant formal dresser having to dish out the cash for an outfit they will, in the best scenario, only wear once a year. However, if it weren’t for the whole outfit debacle, I would love going to formal events. That’s why I thought I would create my own formal(ish) outfit, with things I already own, that are not too hard to find on the high street. I started off with jeans and a t-shirt – my favourite and most basic outfit. Then I added my beloved silk skirt on top, a leather jacket and a pair of patent brogues to top it all off. For a formal event I would definitely advise heels, whichever colour or model would work. I thought of wearing them in the photos but realised they wouldn’t work well with cobblestone and thought I would let practicality win this time. As you would have seen if you’ve read one of my latest posts, I don’t do great with abiding by dress codes. a) Prom dresses over t-shirts, paired with sparkly loafers. You’ll be able to dance all night, and won’t have to worry about your strapless dress falling off. 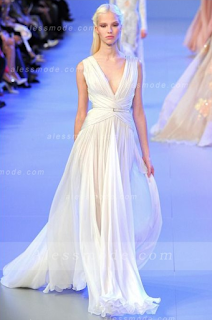 b) Wedding dresses over jeans, paired with pointy toed mules (if possible, Chanel ones). I know this is a bit of an outlandish one and not every wedding dress can be paired with jeans, but just how cool would that be? If going for the wedding dress is too much you can also try wedding party dresses. c) Bridesmaid dresses under oversized denim jackets, worn with Stan Smiths and sparkly socks. Forget about the ugly bridesmaid dress and just put your own spin on things; you might end up looking like an 80s ice skater but it’s worth a try. I’m sure most of us would still have our homecoming dresses tucked away in our wardrobes most likely gathering dust (I know I do! ), so why not revive them? If you’re still not convinced, here’s a few other dress options you could switch around and update as you wish – just make sure to show me how you did it!